Make your own cogs and gears! Using the Merge Shapes tools, and multiple shapes, you too can make some pretty impressive shapes! You'll need to make 1 large circle, a multi-pointed star, a medium circle, and a smaller circle in that order. It should look like the shapes on the left. Alter the star so that each of the points is wide enough for each tooth of your cog. The tooth of your cog will be the distance between the medium and the large circle. Take the large circle and star and use Intersect. Then, take the medium circle and merged shape and use Union. Finally, take the merged shape and smaller circle and use Subtract. If done correctly, you should have a cog similar to the shape on the right in the picture above. Re: Make your own cogs and gears! Is it possible to add animation to the cog? A. 2 (or more) cogs in gear and spinning - of course reverse directions? B. Different size cogs with different gear ratios each spinning at a different speed? I would gladly use that with topics referring to teamwork, processes, work flow and the like. Till now I thought that perpetual animation in PPT was only possible through animated gifs. That's why I still don't understand how johnr got his Wheeling Spheres to cycle perpetually on a single slide...! 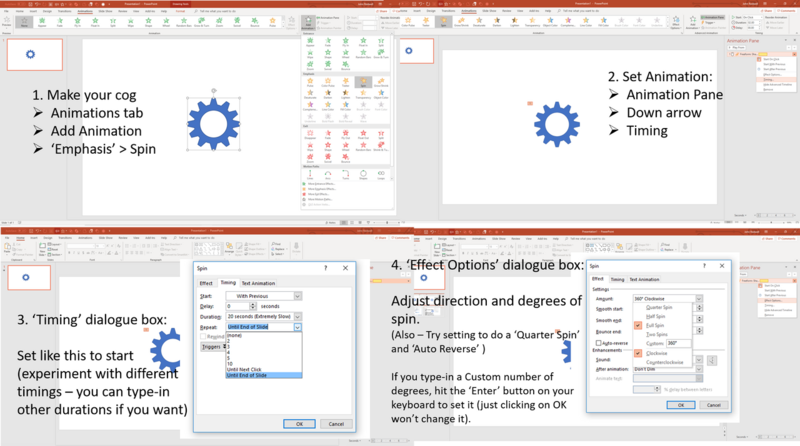 It certainly is possible to animate the cogs in all the ways you mention above - and more! I've put this little tutorial together to show what you can do. I've shown the animation for one cog, but you can make as many as you like and adjust the animations to suit. It will also solve the 'perpetual motion' mystery for you! Hope it makes sense and gives you enough information to experiment and have fun with. This is what I achieved. An introduction like "Observe the cog wheels for a short while and tell us what TEAMWORK means to you?" should do the job to start the training rolling. I had to make things easier for myself by keeping ratios between the no of teeth and the timings. I couldn't do it with just random teeth and trying to get the timings. After a few minutes you could see things were slowly getting out of sync. Immediately visible are the inconsistencies in the shapes of the gear teeth. How can I make things really even? The PPT 'adjust' command seems not to be enough. This really does look good! I doubt if your audience will notice any small inconsistencies. I was especially impressed by the cogs within cogs - not something I would have thought of doing. However, did you 'Align' all your star and circle shapes before making the cogs? That is: select all the shapes then: Home > Arrange > Align > Align Center / Align > Align Middle. This ensures everything is aligned exactly before you make the intersections, unions and subtractions to make the cogs. P.S. I used to be trainer / facilitator too on topics like team-working, motivation etc and a long time doing trainer-training. Yahretzky wrote: Well, how about that! Maybe sometime we'll exchange training experiences, especially if you heard of TACK Training. We could develop some fun&inspiring slides for trainers to make use of. I'll fix that and post a link to the fixed version for others (trainers?) to make use of! I got totally into cogs and gears and I'm posting some recent PPT slides with different variations on the theme. I've fixed the problem with the alignment within shapes. My goodness, cogs everywhere! They look great. I wonder if it's possible to make a game out of them where you have a selection of pre-animated cogs that have to be moved into the correct space or sequence in 'Presentation' mode then played in 'Show' mode to see if they work together and maybe produce an end product or event. Might be worth an experiment! I was thinking the same about a game. John - go ahead with the experiment! I'll be glad to help. A quiz? A formula to calculate the timings for different outward and inward gear ratios? A challenge? Look at my slide no 4 with the black background and the cogs within cogs. The challenge could be to make 7 cogs within cogs to spin in synchronization without a time miscount... that means after some time of running they are still perfectly in full sync. I managed with 5. With 6 the timings for me were off by thousands of a second (according to my formula) which became more and more visible with time. PPT 2016 works only with hundreds of a second. I still believe that 7 are possible but it requires careful calculation out-front. And perhaps a different approach to the no of teeth facing outward vs inward for each cog. Wow! Here's a version of cog wheels with some sound files from freesound.org (thanks johnr! I got the link from your post while admiring your pool game video teaser - amazing graphics and physics!). The sounds can be manipulated to some extent (length of sound, loudness, combining sounds on one slide) at edit level or simply deleted. As you can probably notice my last slide has 6 sound files with the same sound. On each one I successively shortened the beginning of the sound so the same sound sequences wouldn't overlap. It gives the effect of a multitude of spinning gears. P.S. Slide no 4 has now 6 cogs within cogs in full sync! At the cost of slowing down the animation. It has taken me a while to respond because I got hypnotised by the last slide and have been wandering around like a zonked-out zombie ever since!